I acquired this tray from one of my local South African antique auctioneer. The catalogue description was purposefully vague. I discussed the piece with the auctioneer. Neither of us could find a reference to these particular marks. I carefully checked through Bennett's "Collecting Irish Silver" which is the most appropriate reference I have on the subject. I also checked through the regular references such as Tardy's International Hallmarks and the abridged version of Jacksons' Hallmarks. Here is view of the piece from the top. Here is the underside of the piece. 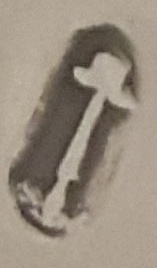 The hallmarks are in the centre of the piece. Here are all the hallmarks. As one can see, there certainly are a large amount of them. I felt like this could be the maker's mark and I present it rotated for easier analysis. I am looking for assistance with this piece. If perhaps the "D" mark (far left) does allude to a year. I have been unable to find this style of harp. Nor anything else. I also did a search of the .925 resources. I hope you will be able to assist me. I'm very interested to know more about this piece. Hi J.S, welcome to the forum. Dutch silver and made in the city of Utrecht, province of Utrecht. The various variations of the Utrecht townmark. Utrecht town mark struck twice to indicate 1st standard silver. (town mark + province mark of Utrecht) 934/1000 fineness. The crowned O is a later added taxfree mark. Utrecht's hat of Liberty, placed on a spear planted in the ground. Please show us some enhanced, clear images of the marks, daylight, no flashlight. The weight of the salver and dimensions also, thanks. Thank you for this welcoming and this extremely helpful reply. The salver is 245mm in diameter and has a mass of 377g. Thanks for the clear images. Great piece, although not Irish!